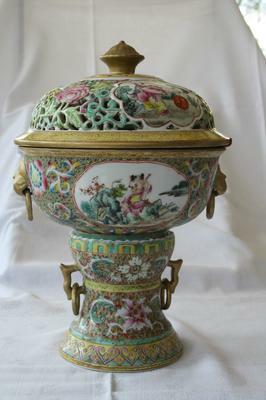 I don't expect this piece to be from the Qianlong period, but I hope it was at least vintage. Thank you. I bought this from an antique shop in the South of France when an old woman died? I found this item among her old furniture. An expert from the region was impressed and showed it to another Parisian expert who thought this item is less than 50 years old. A Chinese antique shop owner in Hong Kong, from looking at the photos, said this is possibly from the Republic period. All agree, however, that the craftmanship is good. 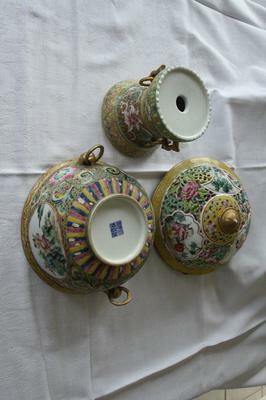 Moreover, there is a Chinese wax stamp for export under the lid, but I have no idea when this approval stamp was applied. A complex shape like this would have been rare in the distand past and might have been imperial. Although the pictures are too small to see details clearly, I can see the way the children are painted, and that is clearly 20th century, more likely second half. You have to learn to recognize people's faces and eyes, because they are some indication when an item was painted. 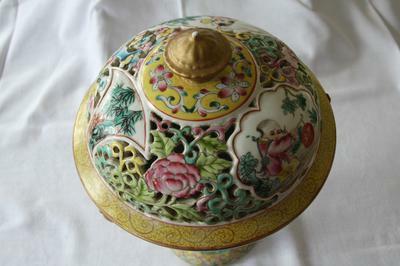 This one shows the influence of western painting, which only entered Chinese painting some time after the Qing dynasty. Also, the mark is a bit too small, but if it is imperial it is more likely a more recent fake. 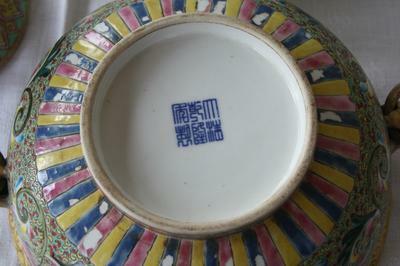 I don't think there are many vintage items with an apocryphal Qianling imperial mark. So, it is either imperial or relatively new (last few decades or so), I would think. Further, you have to check the mark to see if it is too regular. If it is, then it is a printing font.